As a fully trained general surgeon, Dr. Sharon Keene is certified by the recognized medical specialty board the American Board of Surgery. After graduating from the University of Minnesota Medical School, she went on to complete a surgery residency program at the University of AZ Health Sciences, Tucson Hospitals. In 2017, Dr. Keene continues to actively participate in the International Society of Hair Restoration. She is the Chair for the Communications and Public Education committee, Chair for the Past Presidents committee, a member of the Editorial Subcommittee, the Continuing Medical Education Committee, the Best Practices Committee, and Ad Hoc Committee on Issues Pertaining to the Unlicensed Practice of Medicine. In May, 2017, she participated as faculty at the Orlando live surgery workshop session in Florida. In May, 2017, Dr. Keene participated as faculty at the World Congress of Cosmetic Dermatology in Bangalore, India where she lectured on Photo biomodulation, What’s New in Hair Transplantation, and was an instructor in the video session on presentations of live surgery for hair restoration techniques. Further, she is invited faculty for the annual live surgery workshop, to be followed by the annual scientific meeting that will take place in October 2017 in Planco Zdroj Poland and Prague, Czech Republic. At the 2016 ISHRS annual meeting in Las Vegas, Dr. Keene was awarded a plaque for her commitment to promoting high standards of safety and quality of care in hair restoration surgery. She will continue to serve on the Board of Governors, the CME committee, and the Subcommittee on Best Practice Project for 2016 – 2017. Dr. Keene attended the FUE Palooza workshop in Colorado, in September 2016, further sharing and learning from her colleagues continually upgrading, and refining her surgical techniques. She acted as faculty for the ISHRS FUE workshop that took place in Istanbul, in March 2016, receiving a plaque of recognition for her contributions as faculty for the live surgery workshop. At the 2015 ISHRS meeting in Chicago Dr. Keene was awarded a statue in recognition of her outstanding leadership in her role as President for the 2014-2015 term. During her tenure, Dr. Keene promoted public education and evaluation to safeguard patients against mistaking the practice of advertising that promotes a doctor’s credentials, but delegates most of the surgery to non-physicians. At the 2014 International Society of Hair Restoration surgery conference in Malaysia, Dr. Keene was appointed President of the greater than 1000 member international society through September, 2015. She was on the CME, the subcommittee for evidence based medicine, as well as the expert subcommittee. Dr. Keene lectured on laser light therapy for the treatment of hair loss. At the 2013 International Society of Hair Restoration Surgery (ISHRS) conference in San Francisco, Dr. Keene was appointed as the Vice President of the society for the coming year. In addition to her duties as a member of the Board of Governors, Dr. Keene served as moderator for “Recipient Sites and Cosmesis,” lectured on “Hormonal Evaluation of Female Pattern Hair Loss,” acted as director for the “Question the Expert Symposium,” and served on the CME committee. She also was awarded the Platinum Follicle award by her peers for her many contributions. In 2012-2013 Dr. Keene served on the executive committee for the ISHRS. There are over 1000 doctors who are members of the ISHRS, but only 4 are on the executive committee. In addition, she currently serves on the CME committee, the EBM subcommittee on research and resources, the subcommittee Expert Panel, the finance committee as Treasurer, the Ad hoc committee on FUE, and authors Cyber chat for the Hair Transplant Forum of the ISHRS, writing articles pertinent to hair restoration surgery which the doctors review and discuss to further their knowledge. Also at the 2012 ISHRS meeting, she served as a moderator for the Poster Review Session-reviewing key points relating to a variety of studies, and surgical pearls regarding hair restoration surgery. This covered a variety of topics including donor area safety in FUE, hair graft survival in FUE compared with FUT, and robotic hair harvesting. In 2011, she was a member of the board of governors for the ISHRS, a member of the ISHRS Continuing Medical Education committee, a member of the Subcommittee on Expert Panel, and a member of the Ad Hoc FUE Issues Committee. At the 2011 Orlando, Florida ISHRS live surgery workshop, Dr. Keene lectured on the “Evolution of recipient sites and the tools to create them,” as well as “Genetic variation in the androgen receptor gene and Finasteride response in women with androgenetic alopecia mediated by epigenetics.” She also participated in the follicular unit surgery demonstration. At the ISHRS annual meeting for 2010 in Boston, MA, she reviewed new information on the use of “Ace Inhibitors to Treat Keloid Scarring,” (a genetic condition) and presented a poster demonstrating that more hairs per graft does result in a more dense appearance for the patient. She was awarded first place for the poster presentation. At the 2009 ISHRS meeting in Amsterdam Dr. Keene was invited faculty and lectured on genetics and hair loss. Dr. Keene was invited as a member of the faculty for the 2008 International Society of Hair Restoration Surgeon’s (ISHRS) conference taking place in Quebec, Canada. From 2008 to the present, Dr. Keene has authored a column called Cyberchat hair transplant for the ISHRS forum. The forum reviews patient care and allows doctors to share clinical case experience. promote statistically significant, evidence based research in hair restoration. In 2007, Dr. Keene was given the honor of being appointed as the program chair of the International Society of Hair Restoration Surgeons conference for the 15th annual Scientific Meeting. This means she was in charge of organizing the meeting, and choosing the presenters, as well as contributing to and approving the content. Dr. Keene was appointed to the Continuing Medical Education (CME) committee of the International Society of Hair Restoration Surgery for 2006, as well as the Surgical Assistants Executive committee. She is committed to the continuing education of doctors and other medical personnel to continually improve the hair transplant field. At the ISHRS conference in Sydney, Australia in August, 2005, Dr Keene gave 7 lectures on her techniques. At the 2005 Italian Society of Hair Restoration Conference in Modena, Italy, she was awarded the Ghirlandina award for her aesthetic talent in hair restoration. The tower of Ghirlandina in Modena is recognized by UNESCO as a World Heritage site, part of the heritage of man. It was built in 1099 as the bell tower to a cathedral that gave rise to a new style of architecture. Its beauty and originality are renowned. At the 2003 Italian Society of Hair Restoration Surgeons in Rome, Italy, she lectured on “Improving the Efficiency of Megasessions with New Instruments for Dissection and Placing” and “A New Effective Ergonomic Method for Magnification: Video Magnification on LCD monitor.” She was also awarded The Mouth of Truth Award for ethics in hair restoration Surgery. The Mouth of Truth is a historic Roman artifact. The story behind this artifact is that if you put your hand in its mouth and utter a lie, your hand will be bitten off. At the 2003 European Society of Hair Restoration Surgery conference in Berlin, Germany, she was given a certificate for serving as a member of the world renowned faculty. At the 2002 Italian Society for Hair Restoration Surgery, in Florence Italy, she lectured on “Innovative Surgical Technique” and “Hair Loss in Women.” Here she was the recipient of the Michelangelo Award in Hair Transplant surgery for her contribution to naturalness in aesthetics. The 2002 European Society of Hair Restoration Surgery in London, UK where she demonstrated her surgical technique, and use of the multi recipient site scalpel. She was awarded a certificate of appreciation for demonstrating her surgery technique. The 2001 International Society of Hair Restoration Surgery conference in Syracuse, Italy, where she discussed the topic of “Predicting Density with Follicular Unit Grafts”; and again presented her innovative scalpel. The 2000 International Society of Hair Restoration Surgery conference in Hawaii, where she lectured on “Patient Consultations” in the Beginner’s Seminar, and first presented the Multi-Recipient Site Scalpel for improving the efficiency of follicular unit megasessions. The 1999 International Society of Hair Restoration Surgery conference in San Francisco, where she was an instructor in the Surgical Workshop Beginner’s course. Since 1994 to the present, Dr. Keene has attended and assisted in the surgical instruction and presentation of “Follicular Unit Grafting” at the International Society of Hair Restoration Surgery conferences on a yearly basis. Natural Hairline Density in Men: Findings of a Pilot Survey, Sharon A. Keene, MD, Hair Transplant Forum International, Vol. 19, Number 2, March/Apr 2009. “Midline Convergence” in the 2005 fall issue of The Hair Transplant Forum. Dr. Keene contributed to the text book Hair Transplantation 4th Ed, 2004. She coauthored chapter 22 on hair restoration surgical instrumentation. Dr. Keene was also featured as surgeon of the month in the July 2001 issue of The Hair Transplant Forum. Locally in Tucson, AZ, she is recognized as an expert in the hair transplant industry. Doctor Keene served as a consulting doctor for the Arizona Board of Medical Examiner’s, reviewing cases on hair transplant surgery in 1999 and 2000 and 2004, 2005 and in 2010. She has also been consulted, and featured, in Tucson television news programs and articles about hair restoration surgery. Many of the local newscasters have been her patients. Moreover, Dr. Keene is at the forefront in other advances in combating hair loss. She was involved with creating the first genetic test for consumers to help assess their genetic risk for developing androgenetic alopecia. Along those lines she also participated in a study to help determine for whom Finasteride actually is effective. She has also done a pilot study on the use of Finasteride for the treatment of hair loss in post-menopausal women. Further, she has participated in the scientific study of hair line placement and design along with some of her colleagues to helps create natural placement. In addition, she has conducted primary research to more accurately estimate density in order to provide more accurate information regarding what type of density nature provides to help determine realistic density in hair restoration surgery. International Alliance of Hair Restoration Surgeons, and the Coalition of Independent Hair Restoration Surgeons. The International Alliance of Hair Restoration Surgeons is available on the internet at iahrs.org. 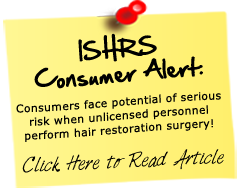 “Membership in the International Alliance of Hair Restoration Surgeons (IAHRS) is a privilege accorded only to a select and elite group of physicians of the highest moral and professional standards; it is not a right granted automatically to every applicant.” (iahrs.org) The Coalition information is available at tucsonhairloss.com. She was granted membership to this organization based on her skill, experience, integrity, and the quality of patient results, however, these organizations also do charge a membership fee for the medical doctors who are included. While the techniques employed by Dr. Keene produce a completely natural and aesthetically appealing result, she continues to strive for improvements. She created an instrument called the multi recipient scalpel that improves the efficiency of creating incisions, but keeps this critical step in the hands of the physician rather than the assistants. She also has worked to increase the visibility of gray hair, which is difficult to see even with the use of the standard microscope. This involves the use of a dye with liposomes to get color into the gray hair shaft. In addition, she utilizes a new form of magnification that offers ergonomic and oversight advantages when compared to the microscope used by most advanced hair restoration practices. It involves the use of a high-resolution digital video camera, in conjunction with a backlight, projected onto an LCD screen. After utilizing this technique for some time in her practice, she shared it with other doctors at the Italian Society of Hair Restoration Surgery in Rome, 2003 and it has been adapted by many prominent clinics. Moreover, she designed a graft holder that keeps the grafts well hydrated during placing. She is presently working on creating additional tools and other improvements, encourages other doctors in the field to do the same, and stays abreast of new developments by attending and participating in conferences. Dr. Keene employs either the strip technique for donor removal, or Follicular Unit Extraction, depending on your preferences, goals, donor availability, and individual scalp characteristics. The techniques Dr. Keene currently utilizes are the most advanced hair restoration surgery technique currently available.